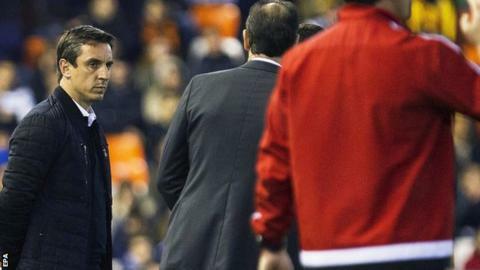 Gary Neville faced criticism from Valencia fans as his side suffered a third successive La Liga defeat, losing 2-0 at home to Celta Vigo. Some called for Neville to go, with the ex-England defender having overseen only three wins in his 16 league games. Celta went ahead through ex-Manchester City striker John Guidetti with 10 minutes to go and added a second through Hugo Mallo four minutes later. Valencia are six points above the relegation zone with eight games to go. The club went out of the Europa League last week, despite beating Athletic Bilbao in the second leg of their last-16 tie, and still have to face four of La Liga's top six in Barcelona, Real Madrid, Villarreal and Sevilla during their run-in. Neville said: "We must focus on the last eight games of the season. From my point of view, the situation is not good and the results not good enough. The fans are rightly frustrated, as am I." England coach Neville has delayed meeting up with the national squad for friendlies against Germany and the Netherlands in the build-up to Euro 2016. Match ends, Valencia 0, Celta de Vigo 2. Second Half ends, Valencia 0, Celta de Vigo 2. Orellana (Celta de Vigo) hits the right post with a right footed shot from the right side of the six yard box. Assisted by Daniel Wass with a through ball. Offside, Celta de Vigo. Orellana tries a through ball, but Planas is caught offside. Substitution, Celta de Vigo. Theo Bongonda replaces Nolito. Attempt missed. Orellana (Celta de Vigo) right footed shot from the right side of the box is close, but misses to the left. Assisted by Hugo Mallo following a fast break. Attempt missed. Jonny (Celta de Vigo) right footed shot from outside the box is high and wide to the right. Attempt saved. Daniel Wass (Celta de Vigo) left footed shot from the centre of the box is saved in the centre of the goal. Assisted by Orellana. Goal! Valencia 0, Celta de Vigo 2. Hugo Mallo (Celta de Vigo) right footed shot from a difficult angle on the right to the top right corner. Assisted by Planas. Substitution, Celta de Vigo. Planas replaces Guidetti because of an injury. Delay in match Guidetti (Celta de Vigo) because of an injury. Goal! Valencia 0, Celta de Vigo 1. Guidetti (Celta de Vigo) right footed shot from the centre of the box to the centre of the goal. Assisted by Orellana. Substitution, Valencia. Álvaro Negredo replaces Paco Alcácer. Attempt missed. Sofiane Feghouli (Valencia) right footed shot from the centre of the box misses to the right. Attempt saved. Jonny (Celta de Vigo) right footed shot from the left side of the box is saved in the bottom right corner. Assisted by Nolito. Pape Cheikh (Celta de Vigo) wins a free kick on the left wing. Paco Alcácer (Valencia) is shown the yellow card for a bad foul. Corner, Valencia. Conceded by Hugo Mallo. Substitution, Valencia. Sofiane Feghouli replaces Rodrigo. Substitution, Celta de Vigo. Pape Cheikh replaces Claudio Beauvue. Attempt saved. Rodrigo (Valencia) right footed shot from the right side of the box is saved in the centre of the goal. Assisted by Paco Alcácer with a headed pass. Guidetti (Celta de Vigo) wins a free kick in the defensive half. Corner, Valencia. Conceded by Sergio Álvarez. Attempt saved. Rodrigo (Valencia) left footed shot from the right side of the box is saved in the bottom left corner. Assisted by Paco Alcácer. Foul by Guidetti (Celta de Vigo). Attempt missed. Paco Alcácer (Valencia) right footed shot from the centre of the box is too high. Assisted by José Gayá. Attempt missed. Danilo (Valencia) left footed shot from the right side of the box is just a bit too high. Assisted by Rúben Vezo. Jonny (Celta de Vigo) wins a free kick in the defensive half.